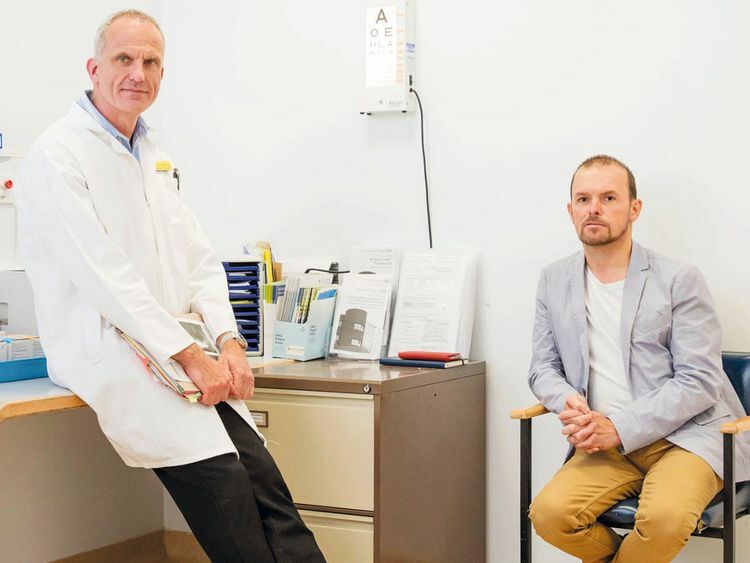 About two years later, Bishop was referred to MacLaren, who confirmed the optician’s diagnosis and identified the particular condition affecting Bishop as choroideremia, caused by a mutation in a gene called CHM. Suffering from that particular condition, which affects an estimated one in 50,000, he was eligible to take part in MacLaren’s groundbreaking clinical trial — and that meant hope. “Suddenly there was a possibility of no longer going blind. That’s pretty life-changing,” Bishop says. What makes gene therapy so revolutionary is that it transforms how we think about medicine, MacLaren explains. “The concept is to treat a disease not with proteins or drugs — things that have a general effect on cells — but by modifying the genetics of the cell itself.” When a patient has a gene mutation — meaning a part of the DNA is missing or not functioning, as with Bishop and his CHM gene — gene therapy offers the possibility of correcting that by delivering healthy DNA-like material to replace what is missing. One of the most difficult questions scientists have faced is how to deliver the replacement genetic material to the cells that need it. They found an ingenious solution: a virus. “A virus is a biological system that has evolved over billions of years to be very efficient at getting into cells and delivering its DNA. If we tried to create a similar organism to deliver DNA in the lab, it would take years — a lifetime. But if we can use an organism that does that already, well, it’s just a case of harnessing the power of that virus,” MacLaren says. Viruses are, in this sense, the Deliveroo drivers of gene therapy. Scientists strip the virus of its own DNA, replacing it with the therapeutic gene that is missing from the patient’s DNA — in Bishop’s case, the missing CHM gene. This is then injected into the cells behind the retina, where it behaves like a Trojan horse, releasing the gene hidden inside. The cells adopt this DNA-like material as their own, and “that DNA is expressed, as far as we know, pretty much for the lifetime of the cell,” MacLaren says. Until recently, there has been no good news at all for children with SMA and their families. In the early 1980s, fewer than 30 per cent of type 1 babies like Cameron would make it to their second birthday. In the last 20 years, advances in supportive care meant 80 per cent of these babies could survive until two years old and even beyond, but their function continued to decline. There were no breakthroughs. The first of those came in 1995, when the French geneticist Judith Melki and her colleagues found the genetic cause of SMA, discovering the SMN1 gene, and what Finkel calls the “back-up copy” — the SMN2 gene — both of which produce the protein that is deficient in babies with SMA. Although SMA does not exist naturally in any other species besides humans, researchers could now give animals the disease artificially, and they studied how it developed in mice, pigs, fruit flies and zebra fish. “None of these totally replicates the human condition, but they each give us a clue as to what the disease does to the body, particularly to these motoneurons,” Finkel says. And that meant they could start developing treatments. The first drug to be developed, known as Spinraza, is what Finkel calls “gene modulation therapy” — instead of targeting the faulty SM1 gene, it targets the SMN2 “back-up” gene, which naturally produces only about 10 per cent of that crucial protein, attaching a strand of DNA-like material to give it a boost and make up for the deficiency. When given to mice with artificially-induced SMA, researchers found that they grew stronger, and instead of dying at 15 days of age were living to over 100 days. But would it have the same impact on humans? It would take a clinical trial to find out — one in which children would receive repeat injections into their spinal fluid via lumbar puncture. At the time Cameron received his first injection of this drug from Finkel, two weeks after his diagnosis, he had become totally paralysed. The treatment was a huge risk for the Hardings; they did not want to prolong their son’s suffering if there was no hope for a meaningful improvement; and, as it was so new, there were few other parents they could speak to. Ultimately, Rob says, “It also came down to helping to give meaning to his life if he did die, because he would be helping the next child and the next parents who have to go through this.” Taking that decision was a breakthrough in itself for Cameron and his parents. “We were no longer mourning any more, we were no longer planning a funeral — we were focused on the trial, seeing the effects, and contributing to the research,” Alison says. Even Finkel was amazed by what happened next: “It’s somewhat remarkable. The improvement in the mouse really did predict how these children responded. That’s not usually the case.” Some children did die of the disease. The overall survival rate, however, was vastly improved, and many of those children learned to roll over, hold their head steady, and in some cases even sit. Cameron is not Finkel’s strongest patient — but he’s not the weakest either. To his parents, his improvements are miraculous. In babies who are treated pre-symptomatically, where SMA has been identified through genetic testing, Finkel says there is an even more rapid and robust response to the drug; many of these babies seem to develop normally, walking and speaking as other babies do, never needing breathing support. In December 2016, Spinraza was approved by the FDA in the US, followed by the EMA in Europe, and it has now been approved in the UK for children with the most severe form of SMA. But in August, Nice decided not to recommend it for use in the NHS, for, among other reasons, cost: the injections for the first year alone cost $750,000 (GBP585,000). There is no treatment for SMA available in the UK. This is why Aliya Anjarwalla, when I visit her at her house in London, has started packing up her family’s belongings. The first thing she asks me, very politely, is if I would mind washing my hands. It is not just me, she says: every time anyone walks through that door, including her husband Khalil and their two-year-old son Danny, they must wash their hands. Ayden, their chatty, bright, sociable four-year-old, has SMA type 2 — the less severe but nevertheless life-limiting form of the disease — and is at constant risk of catching a bug. That he stays well now is vital, Aliya says, because she and her family are on the brink of a breakthrough of their own. The next day, the Anjarwallas hosted Ayden’s first birthday party, welcoming 50 guests into their home. “We felt quite shellshocked. We kept a face on for the party, but we left the next day, flying to London to stay with my parents. That week, Ayden was diagnosed with SMA type 2, on March 26, 2015.” Like the Hardings, they were told there was no treatment. 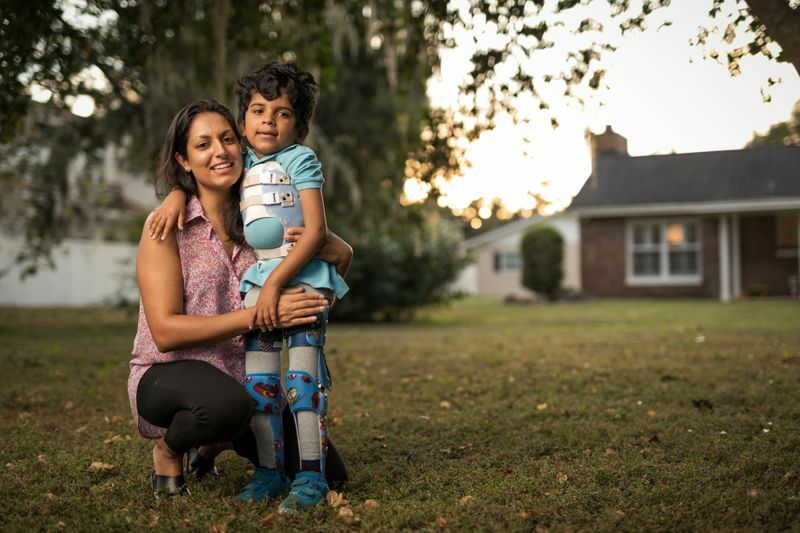 The Anjarwallas spent the next year emailing and chasing, arranging meetings and tests for Ayden, and the day we meet, Aliya tells me, “We’re 95 per cent there.” A week or so later, they will fly to Orlando for one last blood test, to check that Ayden has not caught any bugs. If he gets on to the trial, they will stay out there for at least a year; if he does not, they will be back a week later, back to square one. Although they are sad to leave their family and friends in London, they feel they have no choice. In many ways, Ayden is a typical child. “He’s really into planes, rockets, any kind of vehicle — and he loves construction sites,” Aliya says. But he needs a powered wheelchair, help with cutting up his food and a machine to clear his chest every day. He is also completely adorable — I ask what cartoon he is watching and he shouts, “It’s called Robin Hood!” at the top of his voice. When I ask what he likes drawing, he tells me, “I like to draw pictures.” He plays with my Dictaphone, charming me with a big wide grin. Meanwhile, Cameron has grown stronger, as the weeks, months and years of regular injections have passed. His parents watched in astonished delight as he began hitting new milestones, moving his hands, then his arms, then rolling across the floor, even walking, with assistance. Rob says, “At first, my hope was that he could one day twitch a finger to be able to communicate in binary fashion. Now he’s zipping around in a manual wheelchair — he’s blown us away.” “We feel very, very lucky,” Alison adds.